Fall is a time of year that has everybody in good spirits. Children, teenagers, adults and grandparents all look forward to and enjoy the season in their own ways. With holidays around every corner, fall is an especially fun time for kids and is a really great time of year to spend bonding with family. This is a classsic but it always renders great results. It is one of the simplest kids fall crafts, yet the most artistic. It is a great way for you and your little ones to stay in touch with nature this fall. Pick a morning (or a gorgeous fall evening) to go leaf collecting. Collect leaves of all shapes and sizes. The only criterion is that they have to be in tune with the colors of fall. When everyone has collected a good amount of leaves, round up the flock and head back home. Set the mood with a warm fire and some hot chocolate. Gather around and spread out a large sheet of paper. Grab a bottle of glue and start gluing leaves on to the paper until most of the blank spaces are covered. Sign all your names at the bottom and you are done! The beauty of a collage is that it doesn’t need to be neat or symmetric. Frame your masterpiece after it has dried and flaunt it on your living room wall! This is another great activity that kids absolutely enjoy. It does, however, require a little bit of preparation on your part. Before you start, peel and halve a couple of potatoes. Use a knife to carve out pumpkin faces on the flat sides of each piece of the potato, just like you would do for a pumpkin. Now all that’s left to do is for your kids to dip the potatoes, face down, in orange paint and print them on the pieces of paper. If your kids are old enough to handle knives safely, let them carve faces of their own on individual potato halves. 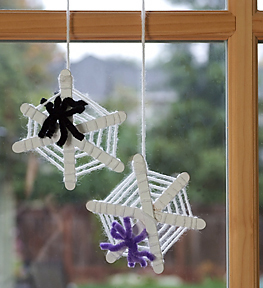 These spider webs are easy to make and are an absolutely adorable fall craft for kids. In the spirit of Halloween, these would make an excellent craft activity. All you need is some wool, 3 Popsicle sticks per web and pipe cleaner for the spiders. 1. Take two Popsicle sticks and glue them together in the middle to make an X. Take the third stick and place it down vertically. Glue the X to the center of the vertical stick. reach the center, cut off the wool and glue the end to the back of the stick. 1. Measure the radius of the web and cut out 4 pieces of pipe cleaner of the same length. 2. Take two pieces, cross one over the other and twist it around the center once. 3. Add the other two pieces one at a time in the same way, joining each one at the center. 4. Bend the tip of each end outwards to complete your spider. Use different colored pipe cleaner for cuter spiders! These calming glitter jars are one of the best fall craft ideas for kids who have just eaten a whole lot of candy from trick-or-treating. Sugar charged kids are a handful for any parent and these fall glitter jars are truly a godsend. 1. Ask each child to choose their colors. They can choose to make a single colored jar or a combination of the fall colors. 2. Empty the glitter glue of the desired color into the bottle. 3. Add a teaspoon each of the fine and large glitter. 4. Dilute the glue in some water until the consistency is runny but still thick. 5. Fill up the bottle with this mixture, leaving an inch from the top. 6. Seal up the bottles and shake them until they begin to glitter! When the kids come back home from trick-or-treating, sit them down with their bottles and ask them to concentrate on the glitter until it settles down completely. Just notice the change in their energy levels after that! Got any more to add to that list? Tell us!